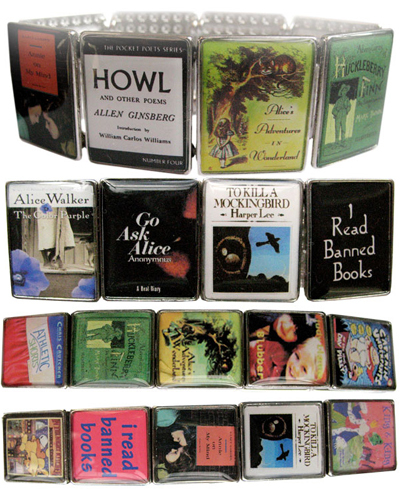 I love banned books- its amazing with all the movies, the news, the celebrities, the war, and the general state of the world that books are still being banned. Celebrate them!!! Read them, Love them!!!! 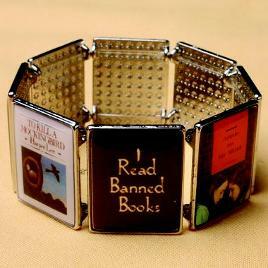 this is my FAVORITE BRACELET I wear it all the time and have done for the last three years....... these bracelets were designed To help raise awareness that books continue to be challenged, ALA's Office for Intellectual Freedom designed bracelets featuring the covers of frequently challenged books. . These bracelets were designed by Carolyn Forsman, jewelry designer and longtime supporter of the Freedom to Read Foundation. * GREAT VINTAGE BUCKLE ! * Born Emilie Charlotte Le Breton, was a highly successful British actress born on the island of Jersey. A renowned beauty, she was nicknamed the "Jersey Lily" and had a number of prominent lovers, including the future King Edward VII. Emilie was the only daughter of the Dean of Jersey, Rev. William Corbet Le Breton. He gained an unsavoury reputation because of affairs and, after his wife left him, he left Jersey in 1880. He had eloped to Gretna Green with Lillie's mother, who was known for her beauty. In 1842, he married her at Chelsea. One of Lillie's ancestors was Richard le Breton. She had six brothers, all but one older than she. Proving too much for her French governess, Lillie was educated by her brothers' tutor, becoming unusually well educated for women of the time. 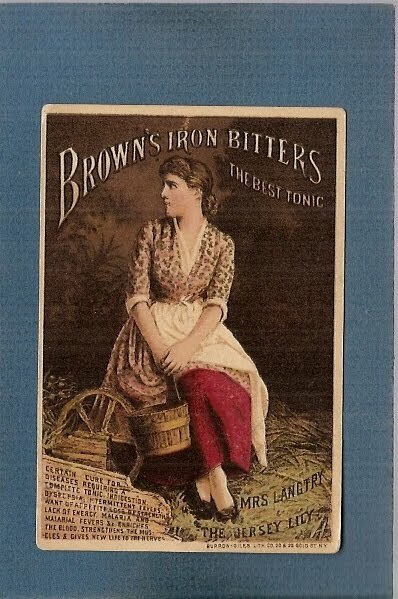 In 1874, twenty-year-old Lillie married twenty-six-year-old Irish landowner Edward Langtry, the brother-in-law of her brother William's wife. He was wealthy enough to own a yacht, and Lillie insisted that he take her away from the Channel Islands. Eventually, they rented a place in Belgravia, London. “It was through Lord Ranleigh and the painter Frank Miles that I was first introduced to London society… I went to London and was brought out by my friends. Among the most enthusiastic of these was Mr Frank Miles, the artist. I learned afterwards that he saw me one evening at the theatre, and tried in vain to discover who I was. He went to his clubs and among his artist friends declaring he had seen a beauty, and he described me to everybody he knew, until one day one of his friends met me and he was duly introduced. Then Mr Miles came and begged me to sit for my portrait. I consented, and when the portrait was finished he sold it to Prince Leopold. From that time I was invited everywhere and made a great deal of by many members of the royal family and nobility. After Frank Miles I sat for portraits to Millais and Burne-Jones and now Frith is putting my face in one of his great pictures." 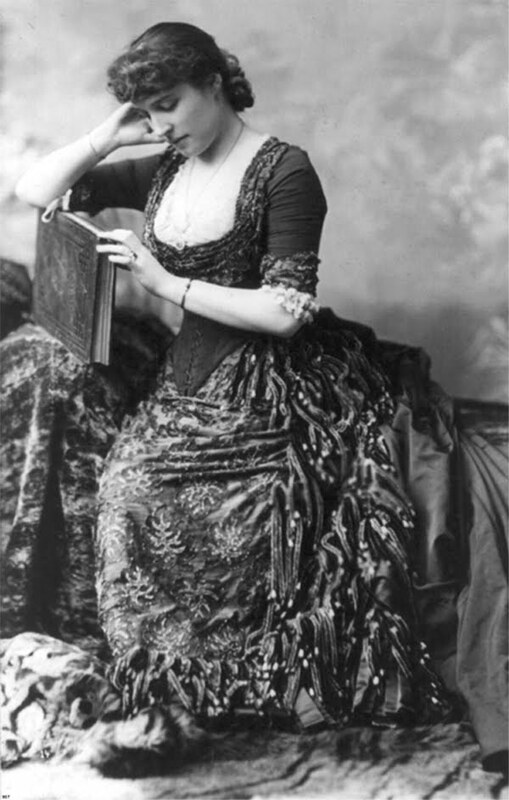 Lord Ranelagh, a friend of her father and sister-in-law, invited Lillie Langtry to a high-society reception at which she attracted notice for her beauty and wit. In contrast to more elaborate clothing, she wore a simple black dress (which was to become her trademark) and no jewelry. Before the end of the evening, Frank Miles had completed several sketches of her that became very popular on postcards. 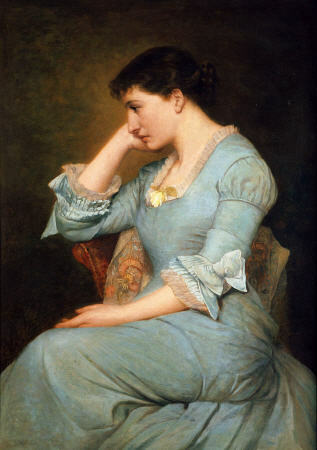 Another guest, Sir John Everett Millais, eventually painted her portrait. Langtry's nickname, the "Jersey Lily," was taken from the Jersey lily flower (Amaryllis belladonna) – a symbol of Jersey. The nickname was popularised by Millais' portrait, entitled A Jersey Lily. (According to tradition, the two Jersey natives spoke Jèrriais to each other during the sittings.) The painting caused great interest when exhibited at the Royal Academy. Lillie was portrayed holding a Guernsey lily (Nerine sarniensis) in the painting rather than a Jersey lily, as none was available during the sittings. She also sat for Sir Edward Poynter and is depicted in works by Sir Edward Burne-Jones. She became much sought after in London society, and invitations flooded in. Her fame soon reached royal ears. The Prince of Wales, Albert Edward ("Bertie"), arranged to sit next to Langtry at a dinner party given by Sir Allen Young on 24 May 1877. (Her husband was seated at the other end of the table.) Though he was married to Princess Alexandra and had six children, Edward was a well-known philanderer. He became infatuated with Langtry and she became his semi-official mistress. She was even presented to Edward's mother, Queen Victoria. Eventually, a cordial relationship developed between her and Princess Alexandra. The affair lasted from late 1877 to June 1880. Edward had the Red House (now Langtry Manor Hotel) constructed in Bournemouth, Dorset in 1877 as a private retreat for the couple. He allowed Lillie to design it. 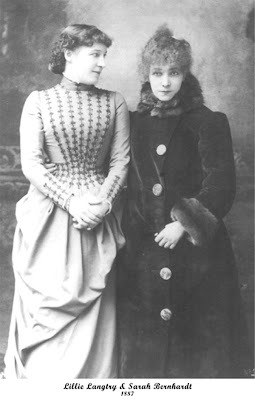 The tradition is that their relationship finally cooled when she misbehaved at a dinner party, but she had been eclipsed when Sarah Bernhardt came to London in June 1879. In July 1879 Langtry began an affair with the Earl of Shrewsbury; in January 1880 Langtry and the earl were planning to run away together. In the fall of 1879 there were rumours published in Town Talk that her husband would divorce her and cite, with others, the Prince of Wales. For some time, the Prince saw little of her. He remained fond of her and spoke well of her in her later career as a theatre actress. t the suggestion of her close friend Oscar Wilde, Lillie embarked upon a stage career. 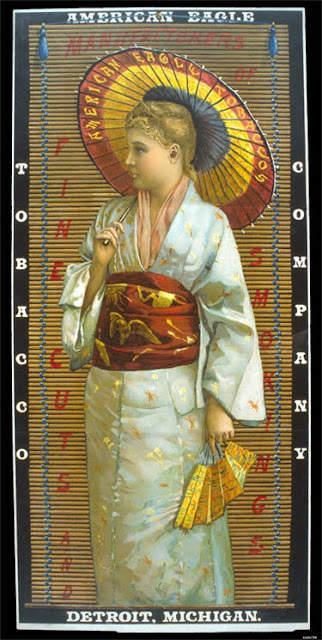 In December 1881, she made her debut before the London public in She Stoops to Conquer at the Haymarket Theatre. The following autumn, she made her first tour of the United States, to enormous success, which she repeated in subsequent years. 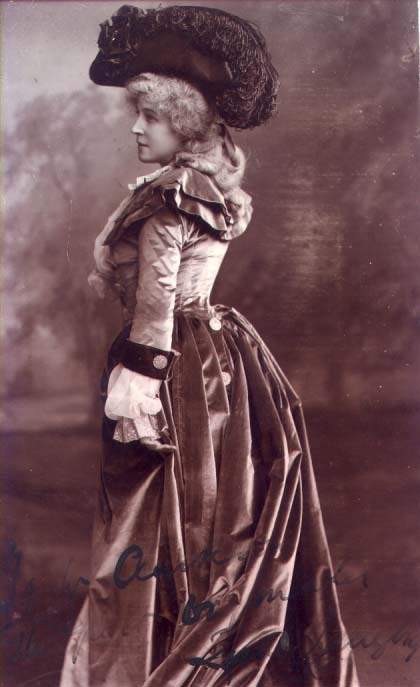 While the critics generally condemned her interpretations of roles such as Pauline in the Lady of Lyons or Rosalind in As You Like It, the public loved her.In 1903, she starred in America in The Crossways, written by her in collaboration with J. Hartley Manners. 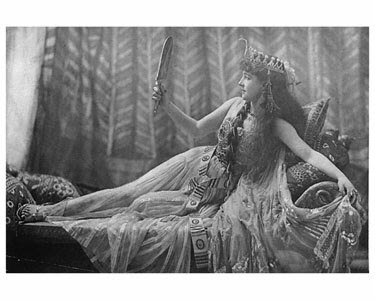 She returned to the United States for tours in 1906 and again in 1912, appearing in vaudeville. 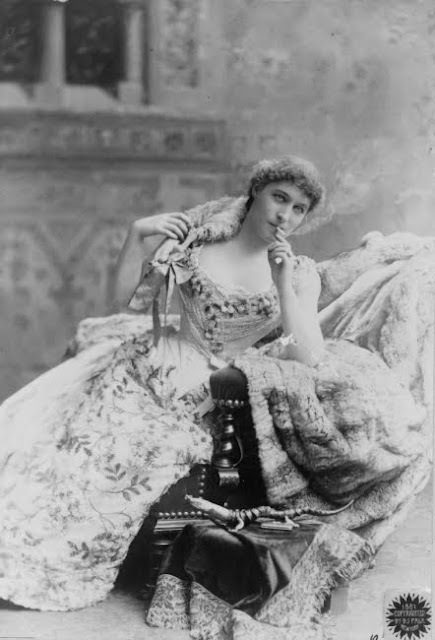 From 1882 to 1891, Langtry had a relationship with the New York City millionaire Frederic Gebhard. With him, she became involved in the sport of Thoroughbred horse racing. In 1885 she and Gebhard brought a stable of American horses to race in England. On August 13, 1888 Langtry and Gebhard traveled in her private car attached to an Erie Railroad express train bound for Chicago. Another railcar was transporting seventeen of their horses when it derailed at Shohola, Pennsylvania at 1:40 in the morning. Rolling down an 80-foot embankment, it burst into flames. One person died in the fire, along with Gebhard's champion runner Eole and fourteen racehorses belonging to him and Langtry. One of the two horses to survive the wreck was St. Saviour. He was named for St. Saviour's Church in Jersey, where Langtry's father had been rector and where the actress chose to be buried after her death.In 1900, Langtry's horse Merman, ridden by American Tod Sloan, won the Ascot Gold Cup. In 1897, Langtry became an American citizen. 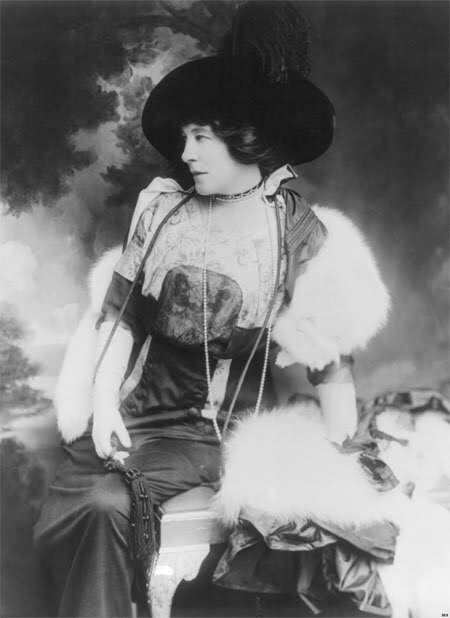 She divorced her husband Edward Langtry the same year in Lakeport, California. Edward Langtry died a few months later following an accident that same year. A letter of condolence written by her to a widow reads in part, "I too have lost a husband, but alas! it was no great loss." In 1888 Langtry purchased a winery with an area of 4,200 acres (17 km2) in Lake County, California which produced red wine. She sold it in 1906. The winery and vineyard are still in operation. From April 1891 until his death at New Orleans in March 1893, Langtry was involved in a relationship with George Alexander Baird, millionaire amateur jockey and pugilist[20. In 1899, she married the much younger Hugo Gerald de Bathe. He would inherit a baronetcy and become a leading owner in the horse-racing world, before retiring to Monte Carlo. 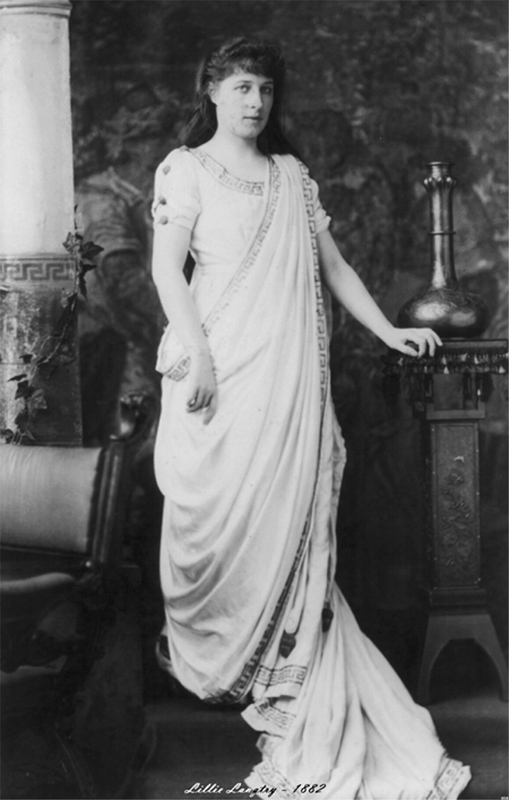 During her final years, Langtry resided in a home in Monaco, with her husband living a short distance away. The two saw one another only when she called on him for social gatherings or in brief private encounters. Her constant companion during this time was her close friend, Mathilda Peat, the widow of her butler. Keen's Chop House in New York says that Langtry sued them in 1905 over their gentlemen's-only seating policy and won, then sailed in wearing a feather boa and ordered a mutton chop. Langtry died in Monaco in 1929. She was buried in the graveyard of St. Saviour's Church in Jersey. went outside to look at moon, swallowed bug, came back inside. Freeking nature.